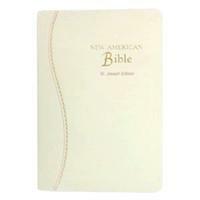 This popular size personal bible set new standards for quality as it offers more beautiful and elegant features. Supple material, blind embossing, foil stamping, precise stitching, and decorative gilding combine to provide an exquisite and unique package for the Word of God. The distinctive features of our St. Joseph Editions, including new maps and Family Record, complete this unparalleled gift. This NAB translation Bible is especially well suited for a Confirmation gift, RCIA gift or for personal study. Also available in green, brown, black, burgundy, and blue! 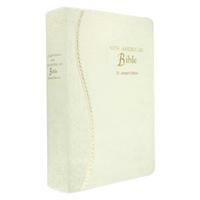 Beautiful Bible--a wonderful gift for my sister, a bride-to-be. Very fast shipping, too! The Bible is beautiful & the engraving was too. I would definitely suggest this Bible as a gift for any occasion. I was very pleased with the ordering & shipping.